With a name like Squirrel Corn my first thought wasn’t of a spring flowering plant, but it’s real! 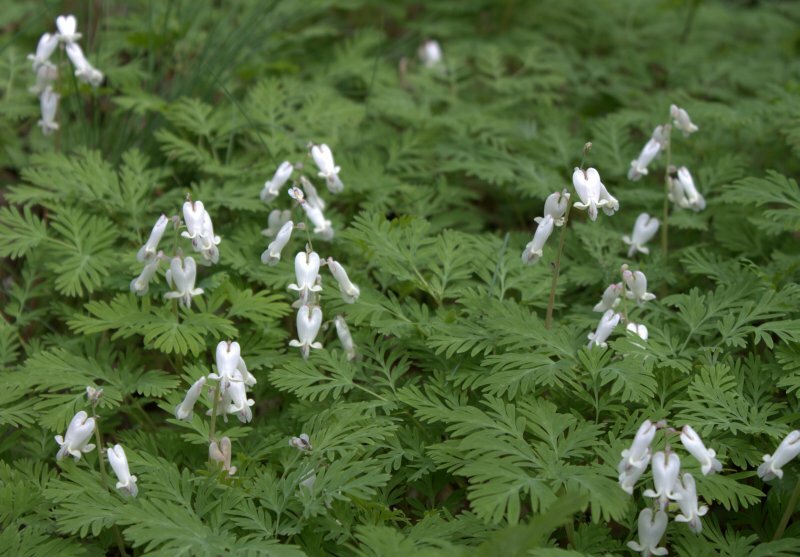 A delicate-looking perennial plant that blooms in early to mid-Spring is commonly called Squirrel Corn. It supposedly gets its name from the yellow underground tubers that resemble kernels of corn. Not sure why “squirrel” is in the name! Perhaps squirrels eat the tubers or play a part in transplanting them. 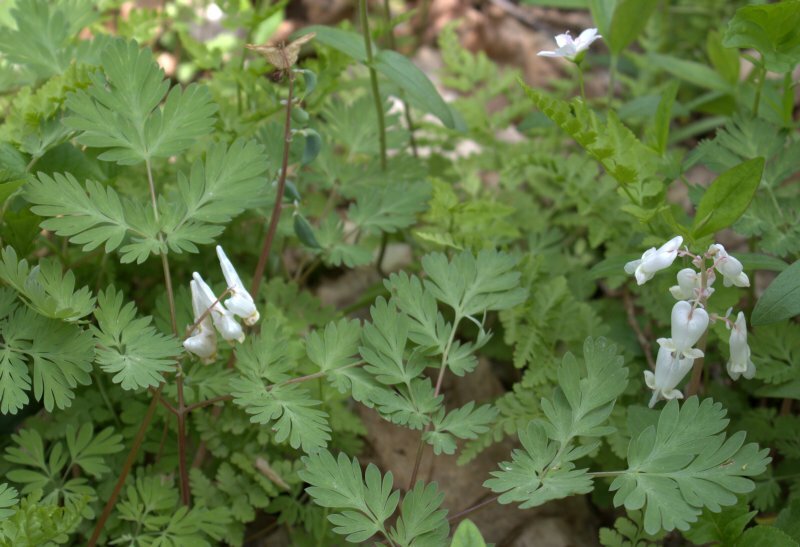 Squirrel Corn, Dicentra canadensis, is native to Eastern United States just like the Dutchman’s Breeches that it was blooming near. Both of these Spring Ephemerals hang their flowers from a leafless flower stalk. Squirrel corn is native to the Eastern United States. 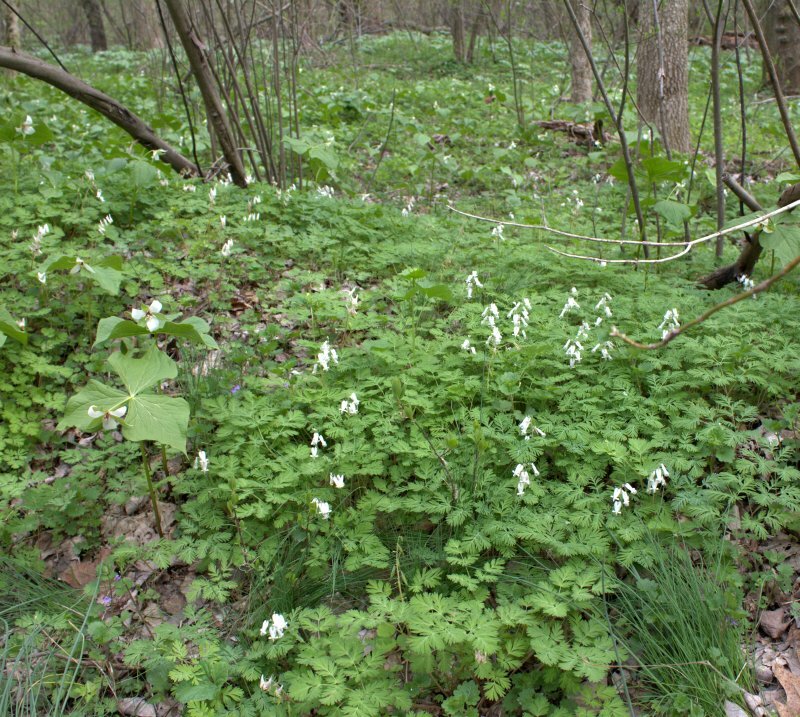 Squirrel Corn blooming on the right and Dutchman’s Breeches on the left. 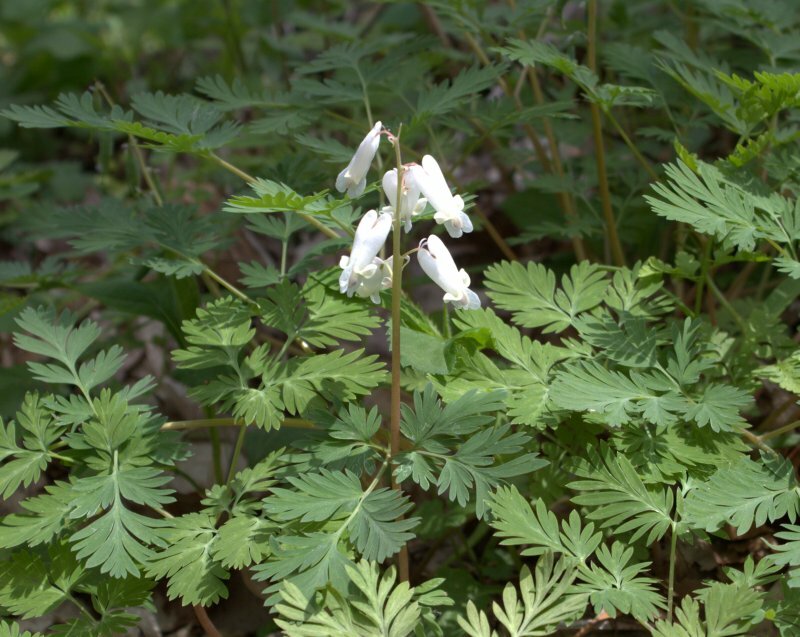 The foliage of Squirrel Corn is very similar to the leaves of Dutchman’s Breeches. Both plants have finely divided leaves that rise up from the center of the plant. If I saw the foliage without the flowers, I’d be hard pressed to say which belongs to what plant unless a side-by-side comparison could be done. Looking down on squirrel corn the foliage appears fern-like. Top view of squirrel corn. 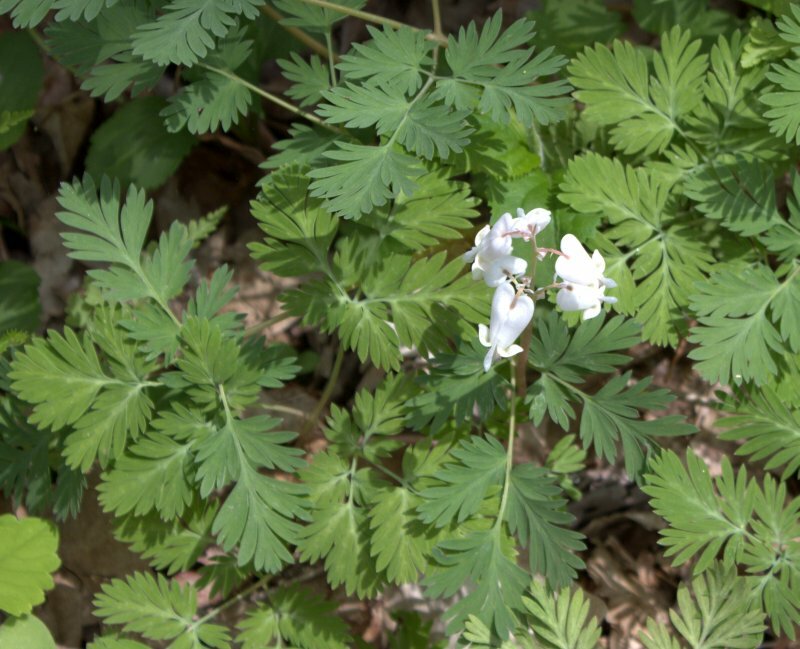 Squirrel corn leaves may be more deeply divided and the divisions appear more rounded at the ends than that of Dutchman’s Breeches, at least in samples we’ve observed. They both appear fern-like as each leaf rises up from the ground with a gentle arching to one side. Squirrel corn flower stalks are held over the mound of leaves. Side view of squirrel corn. Squirrel corn blossoms hang from the leafless flower stem. Note that the small white flowers have two tiny pinkish sepals at the top of each bloom. Other plants in bloom in the same vicinity included bluebells, violets in purple, white and yellow, spring beauty, wild ginger, and cut-leaved toothwort. Trillium, bloodroot and dogtooth violet were petering out and the phlox were just starting to bloom at Shenk’s Ferry Wildflower Preserve, Lancaster County, Pennsylvania. In the river floodplain next to the wildflower trail there were many Squirrel Corn and Dutchman’s Breeches blooming along side Trillium. 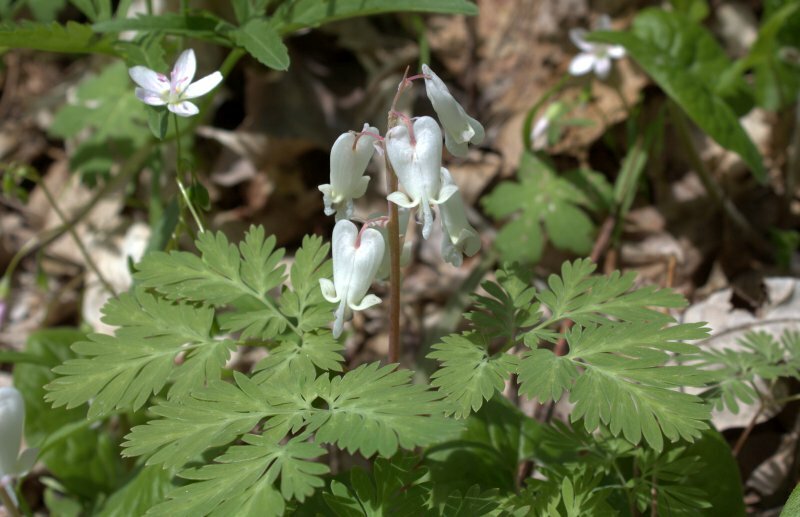 Squirrel Corn flowers look similar to those of garden variety bleeding hearts, an old-time spring flowering plant. Bleeding hearts are native to China and were introduced to gardeners in the U.S. long ago. 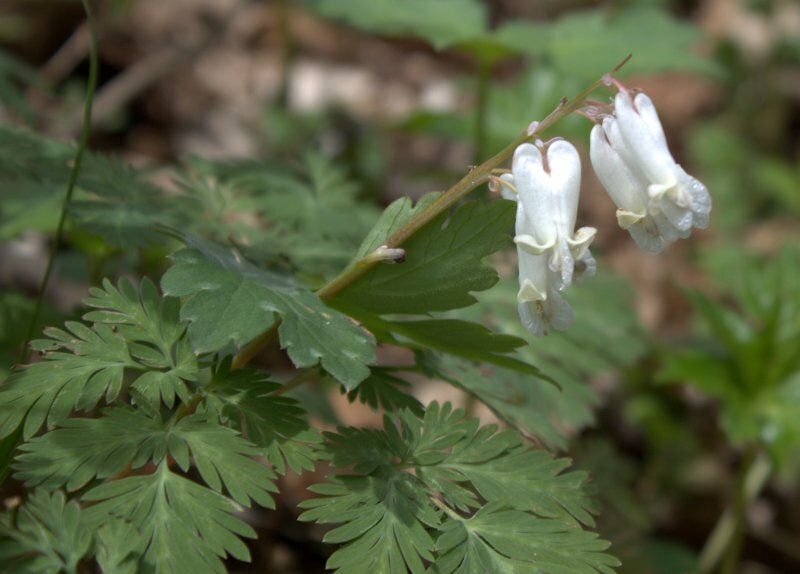 The floral resemblance must be why one of the common names for Squirrel Corn is Wild Bleeding Hearts, not to be confused with the true Wild Bleeding Hearts, Dicentra eximia, another Eastern North American native. 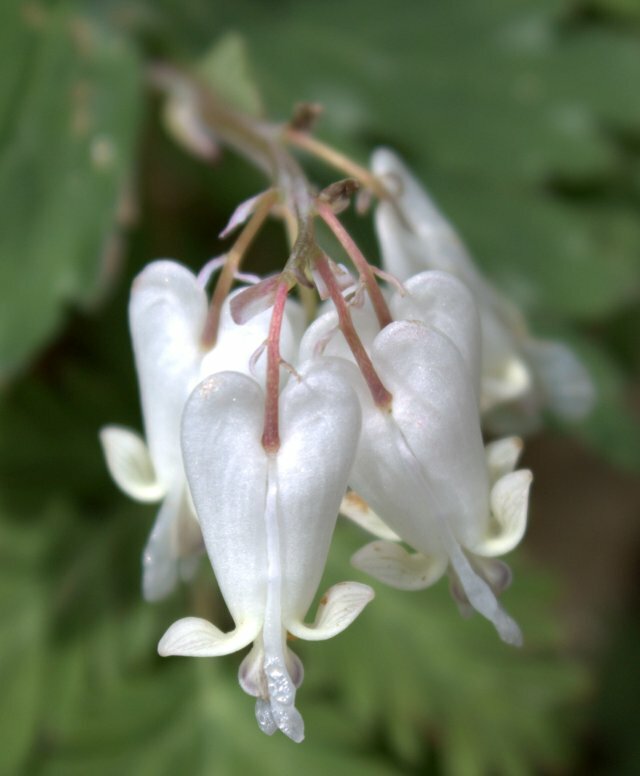 In fact any member of the genus Dicentra may be referred to as bleeding hearts. Close up of squirrel corn flowers look like bleeding hearts. 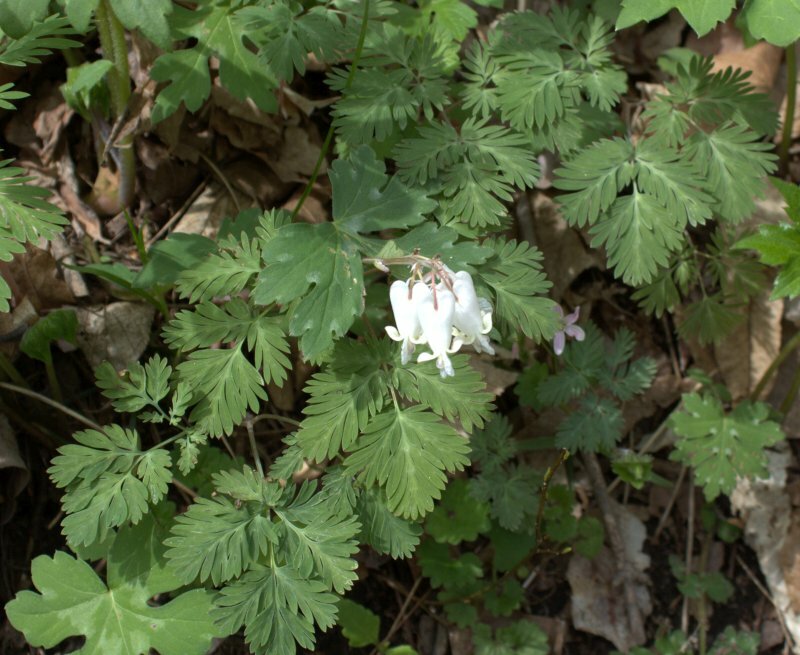 If you want to see Squirrel Corn blooming you’ll have to wait until next season because it blooms in early Spring. Start looking as early as March, especially if winter isn’t as cold as the winter of 2013-2014. Bloom times for early to mid-Spring bloomers all seem to be 1-2 weeks late this year.